Disclaimer: While this is a true story, it is also a stinking funny story, so please feel free to laugh about it. I do. The time has come to end this Accident Memory Lane. I know I know, sad day. I decided to end with a good story about my right lung. The little guy tried to die on me twice, but thanks to the Docs (and God's good mercy) I now have two working lungs. For some reason my family thinks I am a hypochondriac In first grade I faked being sick everyday and went to the nurse cause I wanted to go home. My family has forever judged me because of this. To this day, everytime I feel sick they never believe me. All because I faked it in FIRST grade. Doesn't make any sense to me. So years later when I began complaining that I was having trouble breathing nobody really believed me. Luke wasn't around when I was in first grade, but for some reason he thinks I'm a hypochondriac also. So basically I was walking around with a half working lung and everybody thought I was just faking it. Seems like they would feel bad now. They don't. I was a junior in college and I didn't have a regular Dr. so I went to a walk in clinic. I told the Dr. I was having trouble breathing, he looked straight at me and said, we all have trouble breathing from time to time you are fine. I have considered suing that Dr. but decided against it. A couple of weeks later, I was not only having trouble breathing, but I was having SEVERE pains in my chest and I felt water moving around in my chest (I would later find out it was air from my lung). I went to another Dr. (walk in clinic again, a different one). This Dr. was a little more considerate, he took an X-ray of my lung and chest and tested my heart (cause we didn't know why I was having chest pains). He told me everything was normal and there was nothing he could do. 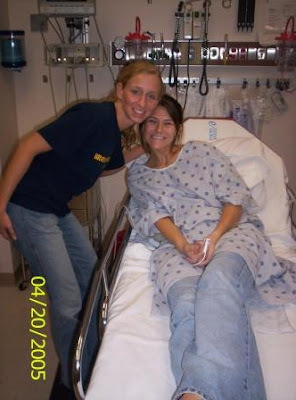 That night I couldn't walk because the chest pains were so bad, my friend Jodi too me to the ER. They checked me out said everything was fine. I went home. The next day I was sitting at work, when my cell phone rang. I answered the phone and a lady asked if she was speaking with Megan. I said yes, and she said "This is ___ from (the walk in clinic) you need to go to the emergency room immediately. Your X-rays came back and your lung is not right. Hm... I wasn't sure what that meant, but I sure as heck knew that it wasn't too comforting. She asked me what hospital I was going to go to, I told her and she said "I will contact them and let them know you are coming, go immediately"
So I called my friend Jodi and she took me to the ER. I walked in, went to check in, told them my name. They sat me in a wheelchair and put oxygen in my nose and wheeled me to the back as fast as they could. Keep in mind we still had NO IDEA what was wrong with me. I looked back from my fast moving wheel chair and Jodi was crying. It was all very dramatic, but at the time I thought I was mere minutes from dying. So to shorten this story somewhat: my right lung was collapsed. Not all the way cause I was still able to breathe on my own, but it was about 20% collapsed. The doctors speculated from my breathing complications, and feeling air in my chest that it had been collapsed for about a month. They said since it was just a minor collapse it would correct itself and I would be fine. I still laugh about that statement. 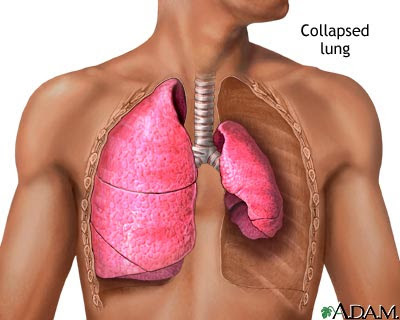 Here is a collapsed lung: This is not me. Here are some pictures from that day in the ER. 3 months later, it is summer and Luke is at church camp. I haven't seen him all week. I go to camp to visit him and he picks me up and hugs me REALLY hard. I felt a pop and start coughing. The next day I felt air in my chest. And think oh, great not again. Luke SERIOUSLY had collapsed my lung. I use it often, If he gets mad at me, I say "Well you collapsed my lung"!!!!!!!!! This collapse was much worse (50%). I ended up spending a week in the hospital, had a chest tube put in (not fun) and they glued my right lung to my chest wall. Yes, I said glued, and it was horribly painful. Worse than childbirth (By the way I've never given birth). So if you are still with me that is the story of my 2 collapsed lungs. To this day I am so paranoid my lung is going to collapse. 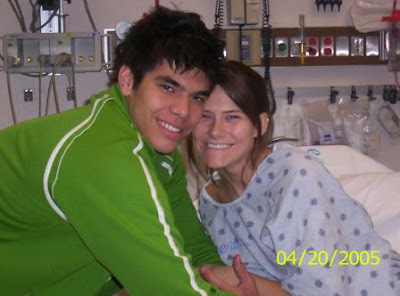 I drove my family CRAZY the week before the wedding, anytime somebody would get close to me or accidently bump into me, or hug me hard I would yell DON'T COLLAPSE MY LUNG. Why am I so paranoid? The parting words the Dr. gave me was, well since your right lung collapsed I would expect your other lung to collapse sometime in your life. Thanks doc, I will send you my therapy bills. Oh my word - what a story. I am so sorry that all happened to you. I hope that it never happens again! And how terrible to docs kept telling you that you were OK.
that is crazy!! I can't believe Luke collapsed your lung! It's not funny but so funny at the same time! I'm going to dig some wedding pics out soon! I am sorry you had to go through all that.. It sure is scary! Oh my gosh Megan, I can't believe you've had to go through that, twice! This is not near to your poor lungs, but I broke my finger a couple years ago, playing football, had to have surgery, and we're pretty positive the thrower was Hubby! How do you look so cute even in a hospital gown?? I will NEVER forget these moments. Can you look back and laugh now or is it still painful? oh my goodness. So glad you are ok! I can't even imagine how scary that must have been! Goodness child, you have had a time with those crazy lungs!! Those pics in the hospital are so sweet. Like, "yeah my lung collapsed but we are still cute." I love it! Oh my goodness! That IS scary! I must say, though, those pics of you and Luke in the ER are cute! You're going to be one of those women who give birth and still look beautiful afterwards (like nothing happened) because you are adorable in those pics!! :) Still smiling through the pain! You poor thing! I bet your sweetie feeling horrible! I love your sense of humor about this! Is everything okay now? I would be so paranoid too! I don't know if I should laugh or not. I felt so bad for you and what incredible pain you had to have had. But there were some funny lines in here friend!! I am glad you are so much better now! What troopers Luke and your friend were!! That is seriously freaky, I did not laugh at all cuz it kinda makes me paranoid! I did laugh at the disclaimer at the bottom about Luke not being that strong LOL. I cannot believe that you had not ONE, but TWO collapsed lungs! I am so glad that someone finally listened to you and took some x-rays of your lungs! I agree with everyone else that the pictures of you and Luke are so cute! Ya'll are such a sweet couple! I hope everything is OK now and that you don't ever have to worry about it happening again. please dont ever say something is worse then child birth ever again. you poor thing!! That is just crazy! I'm glad someone finally listened to you!! That is one awesome friend as well! I left something for you over at my blog..
Oh Girl! I cannot imagine what that is like, but you describe it very well! If I get some time I would love to post wedding pics...they just mandated how much time we can spend on the Internet at work so my blogging time has been CUT! BOOOOOOO!!!! Gosh Megan, I've never heard of such a thing. If I'd been you I'd have been so nervous before my wedding too. I kept thinking I'm glad I didn't hug you too tight when I met you. ;) I could have collapsed your lung. About Cattlemen's....my husband had eaten there but I never had. We had planned on going to Lake Hefner and I saw the billbord for Cattlemen's and my husband said he had forgotten all about that place and took the next exit. It was really good...and we were closer to Bass Pro Shop. I've never heard this story in its entirety...and I'm pretty sure I cried when I did. So sad...a whole month you went like this! Geez!! I'm going to hug you, the next time I see you..gently of course. Oh my goodness!!! I totally missed seeing the last of YOUR wedding pictures! How beautiful! I loved the different shots. My favorite is how they all seemed to look so natural. The two of you make a beautiful couple. Oh my word! I didn't laugh, I felt so bad for you! I can't believe you had to go through this twice. Bless your heart! I really hope that it never happens again. And, you and Luke are so cute! !